The surge of refugees to Europe has helped make it a region of increasing cultural diversity and foreign-born populations, just as immigration to the United States has pushed its foreign-born share to near record levels. But a new Pew Research Center survey paints a picture of a Europe that is far less positive about what greater diversity means for many of its countries. On both sides of the Atlantic, views on the value of national diversity often divide along ideological lines. Europeans who self-identify as being on the ideological left are significantly more likely than those on the right to say that growing diversity makes their country a better place to live. The gap is greatest in the UK, where views of people on the left differ from those on the right by 24 points. In all, substantial right-left gaps appear in seven of the 10 European countries surveyed. In the U.S., those who identify as liberal are also much more likely than conservatives to say that growing diversity is good for America. 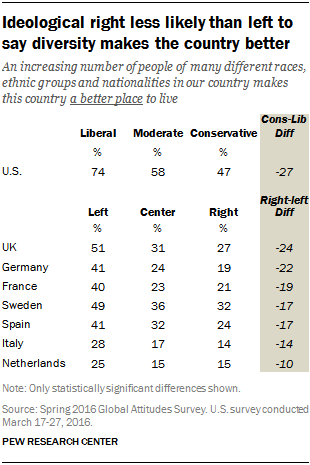 Still, even the 47% share of conservatives who say growing diversity makes the U.S. a better place to live is higher than the share of left-leaning people in many countries in Europe. There is also a substantial education gap on this question in both the U.S. and Europe. In five of the European countries and the U.S., those with more education are more likely to see growing diversity as a positive force. For example, half of British with more than a secondary education say an increasing number of people of different races and ethnicities is good for the UK, compared with only around a quarter of less-educated Brits (26%). In the U.S, roughly two-thirds of Americans (64%) with some college or more like the idea of a diverse society, compared with only 48% among those with a high school education or less.